Many cases of serious fraud are irreparably compromised within 24 hours of discovery. The predominant failures were that first responders did not recognize the importance of planning the initial exchanges or having a Fraud Theory and chronology or a road map in leading them to the “Deep Truth”. Obtain confessions or incontrovertible evidence of guilt, thereby avoiding costly and prolonged litigation. “It wasn’t an interrogation it was a careers interview. The police ended up looking like a sandal wearing convention of bleeding heart liberals”. The rationale given for low-intensity interviewing is that it eliminates the risk of innocent people confessing, under pressure from unscrupulous interrogators, to crimes they had not committed. This can happen. This session discusses recent research by the University of Virginia School of Law into false confessions. However, in the commercial world false confessions are unlikely and easily eliminated by post-interview validation. The downside of ineffective interviewing is a failure to clear innocent people until they have been dragged through courts, it allows villains to escape unpunished, opens to door to counter-attacks, leads to protracted trials, massive legal fees, acquittals and other problems for victim organisations. All could have been avoided by effective and ethical interrogations and interviews in the first instance. Experience is unequivocal: the earlier in an investigation innocent people are cleared of suspicion and bad guys swayed to confess, the better. Hoping that interview failures can be recovered – and the deep truth exposed - through coercion by prosecutors at a plea bargaining stage or in a criminal trial is a fallacy. The session includes a number of case studies and extensive hand out material. It is especially relevant for CFE and other professionals who are the first responders to suspected fraud. IS TESCO THE ULTIMATE “BIG BATH”? WHAT IS A “BIG BATH”? “The strategy of manipulating a company's income statement to make poor results look even worse. The big bath is often implemented in a bad year to enhance artificially next year's earnings. The big rise in earnings might result in a larger bonus for executives. Reported half year profits dropped by 91%; Freshfields and Deloitte were retained to investigate; the careers of eight executives bit the dust; the Financial Conduct Authority, Financial Reporting Council and, inevitably, the Serious Fraud Office got cracking; share values plummeted and bleeding hearts everywhere made the most of yet another example of corporate skulduggery. “Sorry, there are currently no sellers for this product”. Hardly surprising in the circumstances: Innit? A few more facts are now emerging. Revenues of £145,000,000 were, apparently, anticipated prior to the August 2104 half year and a mere £118,000,000 within it. Not £250,000,000 as originally claimed. How come the whistle took so long to blow? Did the Financial Director elevate the original whistling and PWC assure the Tesco board that the accounting treatment was correct? Who benefited from the sudden collapse: any Hedge Funds around? Although Tesco seems an open and shut case of institutional and individual arrogance well known to its suppliers, the SFO should not forget the doomed 2002 prosecution of Wickes which led to acquittals all round and the start of its own downward credibility spiral. “A greater perspective on a company’s culture and effectiveness of its ethics and compliance program can be seen through analysis of reports alleging misconduct and the questions posed about company policies”. Nothing could be further from the truth. In fact high rates on a whistle blowing line indicates a lack of trust in senior management. Whistle blowing should be a pressure release valve of last resort. Problems should be reported and resolved in the management line. This calls for an entirely different approach (including the acknowledgement of ethical performance), clearly defined authorities, monitoring and far better training. 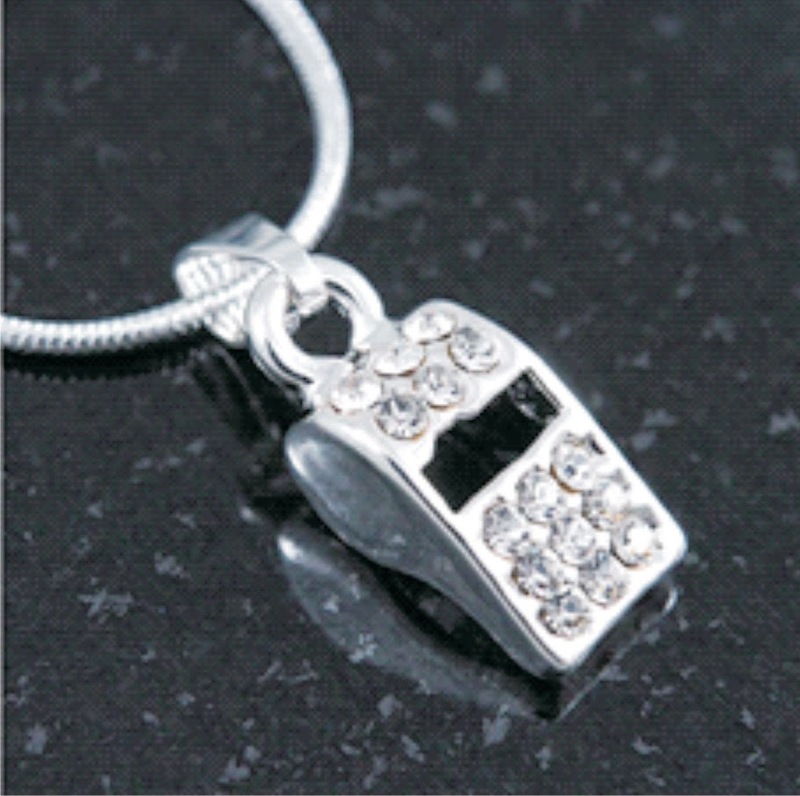 “Small Crystal Blow Whistle Pendant with Silver Tone Snake Chain- 40cm Length”. NOT THE ANTI-FLATULENCE POLICY BUT THE"BEST EVER PROGRAMME ON BRIBERY AND CORRUPTION"
90% of conferences on bribery and corruption are led by regulators, lawyers and others committed to the notion that human behaviour can be controlled by threats, punishment and coercion and through such things as "Anti-bribery policies". If you discovered a company that had an "Anti-murder policy" or one on "Anti-flatulence" what would you conclude? The following 2 day program (PLEASE CLICK HERE) was rated as "the best ever" when held publicly last year. It takes an entirely different approach to inspiring integrity and is being held "in company" throughout 2015. If you currently rely on an "Anti-corruption" policy and want to get it in the right frame and on the right track, please contact us. Campden Wealth has announced an additional session of Mike Comer's Master Class on Fraud, Corruption and Governance to be held in London on 6th November 2014. Please click HERE for details and a booking form. Places will be limited to 100, so if you would like to attend, best to book early. to be held in London between 23rd and 25th September 2014 are now closed. Click HEREhttp://online.flipbuilder.com/Cobasco/rbot/ to see the brochure. An additional session on "Fraud, Corruption and Governance" is being scheduled for 6th November 2014, again for a restricted group of Campden Wealth's clients. If you, or your organisation, has not been invited to any of the above, The Grey Hawk Foundation plans to run sessions for in company groups throughout 2015 and also 90 minute free of charge clinics for professional firms and associations. These will be of special importance to investigators and lawyers who are charged with the duty of interviewing people suspected of criminal offences and where cautions and "Upjohn Warnings" need to be administered. (c) the SFO's recent pronouncement that it expects defendants to waive what it clearly regards as "dubious" Legal Professional Privilege over interview notes and investigation reports whether conducted by legal advisers or not. If you would like more information about the public programmes , please contact Thegreyhawkfoundation@btconnect.com or info@cobasco.com. A friendly and much respected competitor asked us why we gave away so much of our intellectual capital on this site.... with free publications on interviewing and interrogations, fraud detection, decision centricity, codes of conduct and other important topics. The answer is simple: we genuinely want to help with the fight against fraud, whether for a client or not. "That's great" our competitor responded, "but you are warning the bad guys, who can plan their way around difficult questions and respond in ways you say are indicative of innocence". This is a good point if you are not an expert interrogator. Those of us who are, know that deceptive subjects cannot control all of their reactions in the "red mist" of a tough exchange. In fact the more the deceptive subject knows and worries about the clues he subconsciously radiates the better. The result is cognitive overload and increasing anxiety which, if properly handled by the interrogator, leads to the subject losing all confidence in his ability to succeed with deception. It you would like a free copy of our 80 page guide on Interviewing and Interrogations, please click here. And if you represent an "Ultra-Wealthy Family" why not join us for some really mindblowing material at three restricted one day sessions run by Campden Wealth. You can read the brochure here. We know that by helping the victims of fraud with free information, we also assist our competitors. Some download our stuff in bulk, occasionally rebranding it under their own names. But does that worry us? The answer is a powerful "No". Without being too arrogant we believe we are so far ahead in our understanding of fraud, corruption, deception and other skulduggery that the knowledge we do make public helps victims without compromising our competitive advantage or the mass of even better information we reserve for our Clients. So, we hope you find material on our site useful and will give us the opportunity of working with you when the time comes. Initial consultations are free of charge, in confidence and without obligation. If you already have a "mission impossible" case that is getting nowhere we will be happy to submit a detailed Investigation Plan: again in confidence, free of charge and without obligation. Mike Comer is speaking at the "Family Wealth Management and Structuring Conference" organised by Campden Wealth for ultra-rich families and trusts on 8th and 9th April. His topic is "Spotting Scams and Scamsters". Please see the tab on or website under "Training" and clinics.